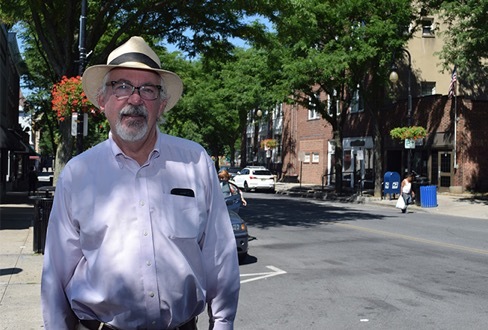 Sleepy Hollow Mayor Ken Wray thinks his village is ready for an awakening. “We really have a once-in-a-lifetime opportunity right now,” he said. The village of Sleepy Hollow recently applied for a $10 million grant from New York State’s Downtown Revitalization Initiative (DRI). The initiative, now in its third year, offers funds that can be used by municipalities to boost local economies, transform downtown areas and improve residents’ quality of life. For Wray, receiving this grant couldn’t come at a better time. “It’s really going to help revitalize our downtown and our downtown businesses,” he said. On the village’s waterfront, developers are in the midst of constructing a sprawling mixed-use project known as Edge-on-Hudson. The development sits just off Beekman Avenue on the former General Motors assembly site. The property sat vacant for years, but a joint venture composed of Diversified Realty and SunCal is working to transform the site into a development that will include 1,177 units of condominiums, townhouses and rental apartments; a 140-room boutique hotel; 135,000 square feet of retail space and 35,000 square feet of office space. The development will also feature a string of waterfront restaurants, more than 16 acres of parkland and a promenade along the water. Developers recently opened up a riverfront walkway that offers public access to that stretch of the Hudson River coastline for the first time in decades. Sleepy Hollow is also moving forward with the development of another section of the former General Motors site: a village-owned piece of land known as the East Parcel. The 28-acre site had served as a dump for decades, and the village is in the process of cleaning up the site to create a new community space. “I’m really excited about that. We’re going to be creating something the village has never had before: a new center, a new village commons,” Wray said. The commons will include new recreation space and parkland, along with a community center, athletic fields and courts, a performance area and a skate park. 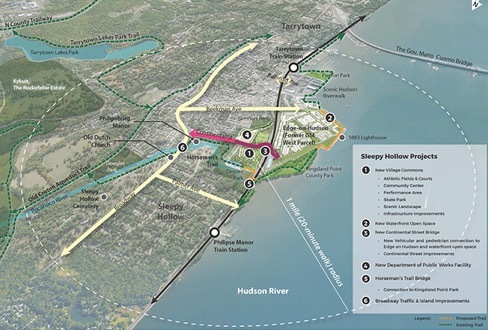 Furthermore, Sleepy Hollow plans to install a bridge over the Metro-North tracks that will connect Edge-on-Hudson with the new commons. Sleepy Hollow also plans to move its Department of Public Works facility from the waterfront location along River Street onto the new village commons. “It will be the last kind of industrial use in a sense on our riverfront,” Wray said. Public Works’ present location is directly across from parkland, and the mayor said he envisions a new residential development with street-level retail or community space as possible uses for that site. The area has already been rezoned for mixed-use. An overview of some of the projects the village of Sleepy Hollow plans to undertake in the coming months. “There’s going to be a very dramatic change to the village over the coming years, and that’s well underway,” Wray said. To do so, Wray said the village is working to develop a new comprehensive plan, a document that has not been updated in decades. A series of public hearings and community outreach meetings were held last year, and the village will continue to work on the updated plan in the coming months. Other economic development initiatives Sleepy Hollow is pondering include creating workforce housing in the former United Auto Workers building on Beekman Avenue, adding sidewalk and lighting improvements along that same road, and improving the intersection at North Broadway that sits adjacent to Philipsburg Manor. The DRI grant could also help the village create and enhance its linkages to the waterfront. The mayor said the village should know by the end of the summer if it will be one of 10 downtowns that are selected each year as part of the annual $100 million initiative. If selected, Sleepy Hollow would become the first Westchester municipality to be awarded a grant through the DRI. Past awardees in the Hudson Valley have included Kingston and Middletown.